Look ma, no dents! or visible rust. I keep forgetting how immaculate my car was before I started autocrossing. 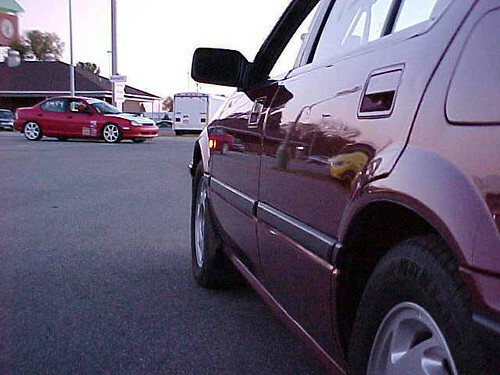 These shots are from my first ever autocross, which was also a G1teg meet. I think it was the last event of '01 at Dixie. Is that the same car that got turned into the STS beast? The black one in the picture went from E Stock to H Stock to STS. He built it to STS after driving my red car one time. The current black one replaced it. The old one was a 91, the "new" one is an 89. 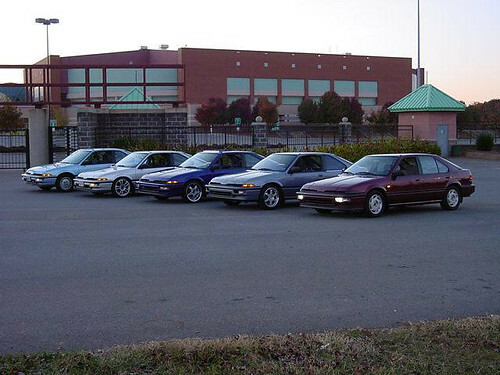 Probably from around 2000 or so and about the second year of autocrossing for me. And yes, that ugly red neon....in mine....and very low for a neon. Last edited by Mooobunnny; 10-24-2007 at 12:38 PM. Mmmmmm...Mr. Pierce's Z. God I love riveted fender flares. My next car will definitely have them. Maybe I'll put some on the teg? why? Justin, Dave, heat gun, and a baseball bat will get the same effect! Let's see what you can dig up from past club events. I can't go that far back, but I'll scrounge and find what I can. Please post the date if you know it. What decade/century/mellennia do you want? The earliest I see posted is just six years old! "RACING IS LIFE, ANYTHING THAT HAPPENS BEFORE OR AFTER IS JUST WAITING". I don't have much in the way of pictures, but do have lots of video from the late nineties and early 2000s. I have them in digital form now on my computer at home and have been meaning to get them up on the web but the files are huge. Reviving a 10 year old thread with some 20 year old video. I have a lot more TSCC videos from this era, but this is the only one I have digitized and uploaded. This was my second event ever, first one was in Danville the previous month. Lol I think this is the only time that damn TVR didn't break down and I remember that new GTI. I can name most of the drivers in your paddock walk. Thanks for the trip down memory lane.